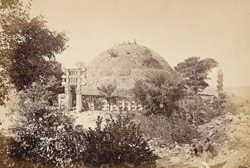 Photograph of the Stupa of Sanchi in Madhya Pradesh, taken by Deen Dayal in the 1870s, from the Album of 'Views of Central India by Deen Dayal, Indore'. The great Stupa of Sanchi is the finest example of monumental architecture of the Shunga era. It consists of a large hemispherical dome which was built over an already existing stupa ascribed to the third century BC from the time of the Buddhist emperor Ashoka Maurya (reigned c. 269-232 BC). The stupa was later enlarged around the first century BC under the Shungas. A processional path at the ground level is surrounded by a balustrade with posts and railings with four elaborately carved gateways at the cardinal points. These gateways or toranas are completely covered of sculptures depicting various episodes of the life of Buddha Sakhyamuni, who is represented aniconically. The Stupa was largely restored after its discovery in the 19th century.